I saw the reviews before I purchased this product. This is a very unique and engaging set. I can confirm that the batteries go out quickly, and the legs are not uniform (two of ours my husband had to adjust). The bottom of the table had a piece missing, it was gouged. However, I only bought this piece to stage a home for purchase. It had enough chairs that I could leave four at the table, two at the bar, one and the telephone station, and one in the box. This Lange dining set from Strick & Bolton combines contemporary design with a fun, futuristic twist. 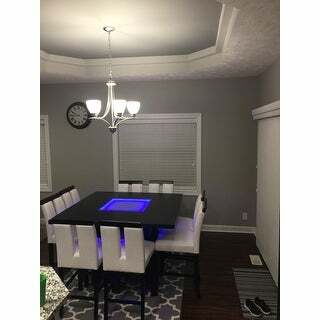 The tempered glass insert of this counter-height dining table features cordless LED lighting to provide your dining experience with a little mood lighting. 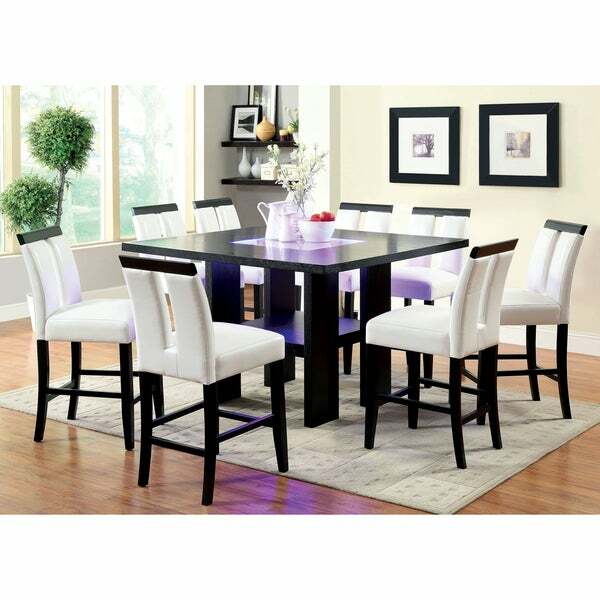 The contemporary look of this table is accentuated by the eight included counter-height keyhole dining chairs upholstered in white faux leather. Assembly required. This set ships in five (5) boxes. 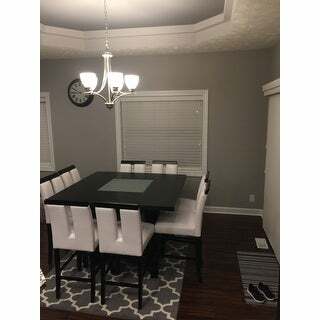 We liked the look of the table and chairs, and after 6 hours of unwrapping all the parts and screwing everything together it looked nice. I rather have paid a bit more to have at least the chairs be chairs when we got them vs. spending 45 minutes on each times 8. The biggest problem with this table is the light. While it is beautiful it uses 8 AA batteries that need to be changed once a week! We do not leave the light on much at all as it drains the batteries in 4 days if you Leave on for three hours a night or less. Looking into buying rechargeable battery kit. Plus getting to the battery box is not easy. For looks and feel, I would give it a 5 but for getting it together, and the light issue it went to three. Wish we could leave the light on more as it us very unique and a wow factor. One of main reasons we were drawn to this table. Perfect for any dining room. Easy to installation. Quick shipping. 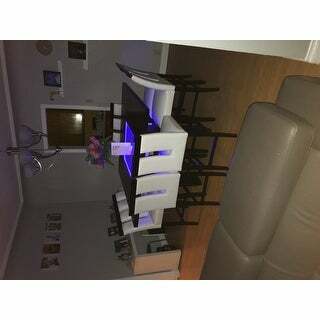 Good and heavy, quality table with frosted glass and led lighting. We would find ourselves accidentally hitting the touch button to brighten/dim lights. I bypassed the switch and wired it directly to the battery pack. Works full power and no accidental touching! Requires 6 AA batteries and last a while if only used for a couple hours at a time. Black finish seems to scratch easily which is fixed quickly with a black furniture marker! Chairs are not as sturdy. The white leather finish is gorgeous but the front cross bar tends to loosen even break if it bears too much weight. You may find yourself buying a pair of extra chairs for replacement parts if yours breaks. Overall I’m very pleased with the product in spite of its little flaws. It’s impressed almost every guest who’s ever seen it and seats 8 which is exactly what we were wanting! I would recommend! 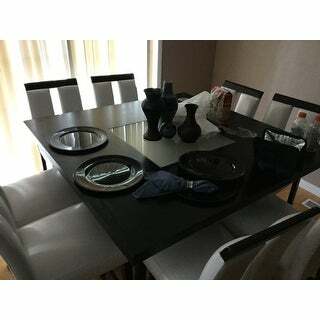 This dining set is beautiful, I saw this same set somewhere else online but cost too much. The product information is accurate, it's modern, and very steady. I love the height. I'm very happy I found it on overstock. I highly recommend this. 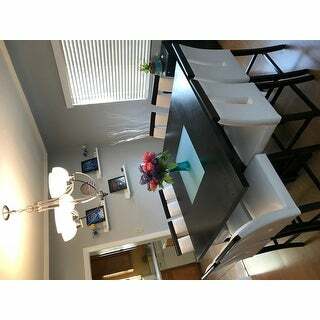 The table and chairs are modern, beautiful, and sturdy. Very well made. The delivery of this large item was superb. Was able to track and contact when delivery company had an incorrect phone number. Was delivered the next day after receiving the correct info. I have had this dining table for more than three years now. Everyone appreciates how good it looks and that it can seat eight people comfortably. Accented it with a red square rug (8x8) and it looks awesome. The overstock customer services are great. There were 2 issues with this dinner sets. 1. The LED lights doesn't light up. 2. 4 out of 8 chairs are wriggling. The problem is that all chairs holes were pre-drilled. So if any one of pre-drilled holes were not leveled or evened compared with any other chair legs, the chair will be wriggled. 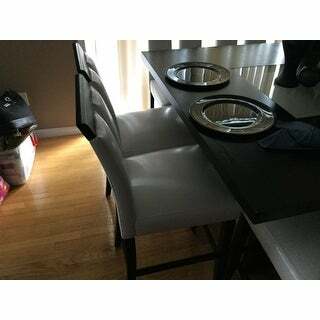 Called overstock, the representative is very helpful and has contacted warehouse to replace entire 4 existing defected chairs. This table an chairs is amazing. The height is fantastic and the look is modern. We had problems with it being scratached by the staples that were shot into the box but customer service sent a replacement. Assembly did take forever so plan on spending hours putting it together. Each chair took about 50 minutes to assemble. The light fixture is super cool and looks like a nightclub! I am in love with this set. It was fairly easy to assemble and it is very, very pretty. I get lots of compliments on it. Love it! Looks very modern and goes with my couch! Beautiful table. Love the light. U have to tap the table over the power box. Took forever to figure that out. Large but not overwhelming. Gives all 8 ppl plenty of elbow room. The set is beautiful. Looks elegant, great quality, although it came with very small scratches (3) not that visible. I had my doubts prior to buying it but no regrets whatsoever. I am very happy with it. My husband didn't have any complaints building it, although it took him time to do it. He had to get his special tools to build it. "the specifications state Black,Brown. what part of the Table or chairs is Brown wood?" This item comes in two colors, grey and black. We do not have a brown version of this item. "What kind of battery does this table take ? " "The pictures look black with a grey/black top but the description says espresso. Is it more black or brown?" 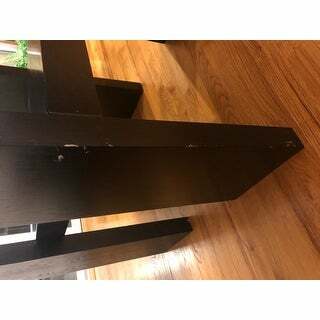 This dining table features a black finish. It does not have a different color top. "Is there anyone that could forward the assembly instructions for the table my set did not have setup instructions"
Please call customer service at 1-800-843-2446, for immediate assistance. 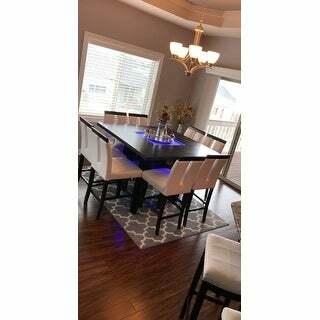 "Hi, Does the light make a royal blue/purple glow when lights are turned on? In the photo with the lights off, it looks like a sea glass color and in the other with lights on, it looks like a blue/purple glow. thank you"
Its a blue neon color. 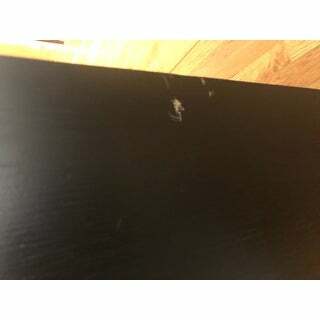 "This is for anyone whom has brought this table: How soon did you guys receive this table? Does it really take the 4 weeks?" "Does this set get white glove delivery. I am disabled and could not assemble it." This item does not include White Glove Delivery. We do not currently offer assembly services. To see if special delivery options and services are available in your area, call our Customer Service at 1-800-THE BIG O and request a transfer to our Oversized Item Delivery Team.